CHICAGO — Penn State has been in the hunt for a College Football Playoff berth the past two seasons but didn’t make it, and there are plenty of reasons to believe the program will indeed reach the Final Four in in the not-too-distant future. The only issue Franklin has with the CFP is that it can be difficult for the committee to compare teams because the scheduling in college football varies so much. “Whenever you have a subjective system like we do, you want to control as many of the variables as you possibly can,” Franklin said. “And right now, when you’ve got a group of people trying to decide who is going to make the playoffs and they can’t compare apples to apples, makes it really challenging. Despite the fact that Penn State has barely missed the four-team playoff a couple of times, especially in 2016 after it won the Big Ten, Franklin is not a fan of expanding the field. “I’m not on the same page with that,” the coach said. “This game, we started out playing 10 games, then we went to 11 games and then 12 games, and now with the playoffs you’re talking about 15 games. That’s a lot of games. Franklin addressed Penn State’s biggest question marks during the opening statement of his press conference Monday. “I do think our offensive line, for the first time since we’ve been there, becoming a strength is going to help with (losing several key offensive players),” the coach said. There are two main concerns, however, on the defensive side of the ball. There has been a lot of talk recently about Manny Bowen potentially coming back to the team, which would conceivably help the middle linebacker depth. Bowen was kicked off the squad prior to the Fiesta Bowl for a violation of team rules and still does not appear on the roster, although there have been rumors that he has been trying to work his way back into favor and onto the squad. Franklin wouldn’t get into the Bowen situation Monday. The coach said there have been no roster changes and that he would address one if it arises. Quarterback Trace McSorley was the only unanimous pick of the 10 players named to the conference’s preseason honors list, selected by the media. The senior has been labeled the best quarterback in the country by several publications and already has broken numerous Penn State records. 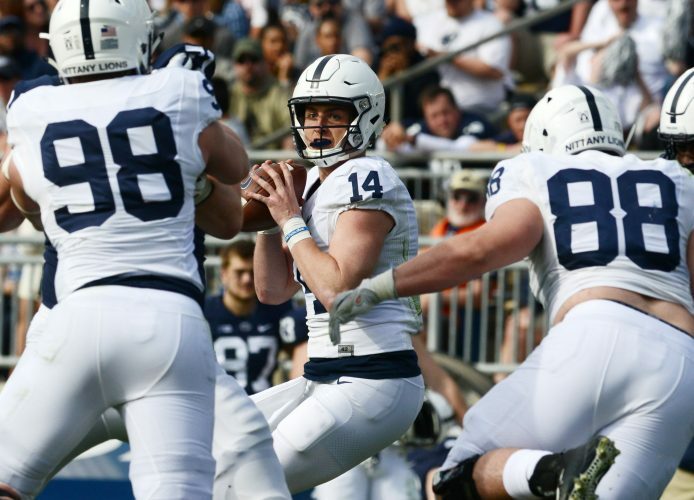 Franklin was presented with a bit of a loaded question when asked to compare the development of McSorley to his predecessor, Christian Hackenberg. The coach didn’t bite on talking about Hackenberg, who already had been at PSU for a season before Franklin arrived. “Trace is really the first quarterback that we’ve been kind of with from the beginning, all the way back to the recruiting process,” Franklin said. Calling McSorley “steady Eddie,” Franklin praised the quarterback’s consistency from day to day. “The thing about Trace that we love so much is that you know what you’re getting from Trace every single day, not just on game days, but practice, offseason, community service, academically,” Franklin said.